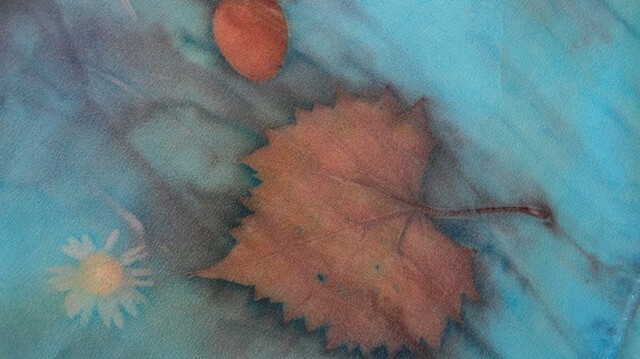 This eco-print silk scarf was dyed with a variety of leaves collected from Roanoke Island (aspin, catawba, eucalyptus, grape, ginkgo, maple, pecan, rose, sumac, walnut, yarrow). The plant prints were highlighted with a bright Caribbean blue acid dye, a technique called "medium print', for a very special and unique piece of wearable art. I prefer this luxurious larger sized wrap since it can be comfortably worn as a scarf or a shawl.